Smart Park / Expresspark's Bob Taylor Helps Save Life of Fellow Employee, Mark Tancredi | Smart Park, Inc.
Smart Park / Expresspark employees Mark Tancredi, Sr. and Bob Taylor were working third shift on a bitterly cold spring night in late March 2013 when events began to unfold that would indelibly change both of their lives. Mark and Bob, both drivers and security personnel for Smart Park and Expresspark, were returning together from fueling a vehicle when a dispatcher radioed that Mark had visitors waiting for him at the lot. Visiting co-workers Kandra Frost and Reed Anderson greeted Mark and Bob upon their return to the lot. The camaraderie of the visit ended moments later when Mark suddenly and inexplicably fell to the ground unconscious. That’s when his buddy, Bob Taylor, rose to action. He immediately went into “crisis” mode, first calling the dispatcher Andrea Corcoran and requesting she call 911 immediately, then assessing Mark’s condition, all the while remaining calm, and trying to keep everyone around him calm. Bob determined that Mark was unconscious with a very weak pulse, so he made sure Mark’s airway was clear and started chest compressions and saying, “Hang in there Mark; you’re going be OK,” until Tinicum Township Officers Andrew O’Neill and Kevin Wiley arrived on the scene. The officers continued what Bob had started, with Officer O’Neill beginning rescue breathing and Officer Wiley beginning chest compressions after determining Mark had no pulse. Next, paramedics arrived on the scene and spent close to 40 minutes stabilizing Mark before transporting him to the hospital. Mark doesn’t remember the events of that March evening when he suffered a massive heart attack that almost claimed his life. 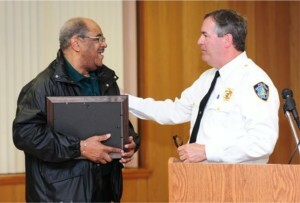 However, weeks later, Mark was well on the road to recovery when he attended a special meeting at the Tinicum Township Municipal Building on April 15, 2013, a meeting in which the people who helped save his life were honored. Tinicum Twp. 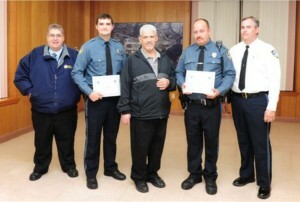 Officials awarded “life-saving medals” and Certificates of Merit to Officers Wiley and O’Neill. Bob Taylor received a Certificate of Merit. Tinicum Township Officer, Mark Tancredi, Jr., Mark’s son, addressed the group on his father’s behalf. 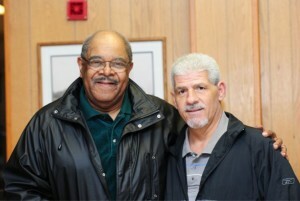 But the biggest reward for Bob and all was seeing Mark Tancredi, Sr., alive and well, in attendance. Bob’s life experience prepared him well for such an emergency. Bob served for four years in the Air Force including a brief stint at Tan Son Nhut Air Base in Vietnam. Following that Bob served 27 years in the NJ National Guard. He also worked for the USPS for 36 years, where he received regular “Safety Briefings” on how to handle emergency situations. He credits his USPS training and the CPR training he received in the Air Force for the ability to rise to action on that fateful evening of March 29. Best wishes to Mark Tancredi for a speedy and complete recovery. Heart-felt thank you’s to Officer Kevin Wiley, Officer Andrew O’Neill, and to Smart Park and Expresspark’s very own Bob Taylor! From left: Tinicum Twp. Emergency Response Instructor Steve Giancristoforo, Officer Andrew O’Neill, Mark Tancredi, Officer Kevin Wiley and Tinicum Twp. Police Chief Steve Edmiston. From left: Bob Taylor and Tinicum Twp. Police Chief Steve Edmiston.